Dehumidifiers are not just beneficial for residential spaces. They can also provide a lot of benefits to commercial spaces. You can just imagine what excess water and moisture can do to your commercial space. Think about how molds can inflict harm to your commercial belongings as well as the customers and employees getting in your building. One way to protect your commercial space and the people getting in and out of your building is to install the best commercial dehumidifier that will take care of the excess moisture problem in your commercial space. Today, there are a lot of dehumidifier brands designed to work in bigger spaces. We looked for those with the best dehumidifying features that can help keep the air you are breathing clean. We also made sure the products we recommend are reliable, energy star rated and portable. Find out more about these products later. 1. How much molds and moisture problem am I dealing with? In order to identify the capacity of the commercial dehumidifier you should purchase, first determine just how big molds and moisture problem you have in your commercial space. How big is the square footage of the space? Where is it located and what is causing the excess moisture problem to begin with? These are the things you need to consider, so you can determine the size of a commercial dehumidifier to buy. 2. Do I need something that I can put in place or one that can be fixed on a wall? You basically have two options when it comes to commercial dehumidifiers. It’s either you go for something that you can mount or something that you can still move. There are portable commercial dehumidifiers out there with casters and a handle that you can use to move the unit around. Which one you should buy still depends on your personal preferences. If you have moisture issues in different parts of the building, a movable one might come handy. If you only have moisture problems in the basement, then stick to one that can be fixed in this space. 3. What humidity range is the best in this room? Some humidity is still good. A dehumidifier can be set, so it can control the humidity levels in the room. Just make sure you know what humidity range is ideal and look for a commercial dehumidifier that can provide that. 4. Is noise going to be an issue? Dehumidifiers can get noisy. A big one can emit a loud and annoying sound that can interrupt your daily operations. If it is in an isolated place in the building, this might not be a concern but if you are going to install it right next to where your employees are working, it can be disrupting. 5. Are there issues about installation? Will something impede the installation of a drain hose? Identify all possible issues first, so you can make a concrete plan on proper installation. This commercial dehumidifier is ideal for bigger spaces with more moisture problems as it can get rid of as much as 232 pints of moisture from the air in just a day. It isn’t just a dehumidifier, it is also an air purifier. It features an Intelligent Control System that works in getting you your desired humidity level. Once you have reached your desired humidity level, the unit shuts down. It has a good energy saving feature that ensures it will not gobble up on electricity. Noise-wise, it is not as noisy as other units because of its Noise Reduction Technology. This is a solid-looking unit. It can work well with the design of commercial spaces. It is built to last. It has been incorporated with internal shockproof technology that prevents internal parts from getting damaged upon impact. The memory function automatically restores settings in case of a power outage. It works quickly. In just 10 minutes, it already improves indoor air quality. This unit has an Auto Defrost function. Its intelligent mechanisms ensure that it will detect frosting in case it happens. It comes with 8-inch wheels for easier transport. Some said it is heavy, but the casters work in making it easy to transport. If you are dealing with water damage on your commercial space or if you are a contractor in need of a dehumidifier for your workspaces, this is a good commercial dehumidifier for you to use. It can get rid of as much as 75 pints of excess moisture from the air. With its roto-molded casing, this won’t succumb to damages easily. This industrial-grade dehumidifier can withstand a high level of abuse, thanks to its tough casing. You can take it to construction and not worry about it getting damaged. This unit has a powerful mechanism. It truly removes moisture as advertised. It comes with a 1-year warranty on its internal parts and 5 years warranty on its housing. It is a Low-Grain Refrigerant dehumidifier. What this means is more power when it comes to removing moisture from the air. It also has a better cooling mechanism. It is much more compact and portable than many commercial dehumidifiers out there. This can be relied on for flooding issues. There weren’t a lot of negative reviews about this product, except for some isolated cases of leaking. Got a big warehouse or a big commercial space to dehumidify? You can rely on this unit that is capable of dehumidifying spaces as big as 7,000 square feet. It is a more compact unit that you can easily transport anywhere you like. It comes with a built-in humidistat, so you can achieve the right humidity levels in your commercial space. Although it has powerful mechanisms, this dehumidifier is compact. It can fit in small spaces like a bathroom. The shape makes this easier to stack as well. This dehumidifier gets rid of up to 17 gallons of excess moisture in the air. This truly works in drying objects in a room saturated with water. The design is nice. It is compact and can be placed in tight spaces. It is easy to store as well since you can just stack it over your other work paraphernalia. It comes with a humidity display. You can keep track of the level of humidity in your commercial space or job site. It has an automatic restart safety feature. In case of a power outage, it will automatically turn back on to continue the drying process. It comes with an automatic pump. The pump removes the collected water into a drain. The casing has a lifetime limited warranty while the refrigerator system comes with 6 years of warranty. It doesn’t have an anti-frost function. This is a refrigerant type of dehumidifier that truly works in getting rid of excess moisture. It can get rid of as much as 64 pints of water in one day from a space. With its roto-molded polyethylene housing, you can be assured that this unit can resist damages as well as leaks. It can be used for industrial and construction purposes. It also boasts of a built-in duct attachment ring. Connect it to a polyvinyl ducting and this will work in improving air circulation and drying time. It gets the job done fast. You can rely on this to extract a lot of moisture from the air. The exterior material is rigid and capable of withstanding damages. The telescoping handles and caster wheels make this easier to transport. You can place this unit anywhere you prefer. It comes with a 1-year limited warranty. The control panel is a cinch to use. It also has an automatic defrost cycle. This works but it can be a bit expensive. High Power: Inofia 232 Pints 29 Gallons Large Capacity Dehumidifier. A lot of customers are satisfied with the power and efficiency of this unit. It truly gets the job done, especially for rooms that are more prone to condensation and excess moisture problems. Great for Construction Zones: BlueDri Compact Low Grain Efficient Commercial Dehumidifier. The tough exterior of this dehumidifier makes this an ideal choice for commercial and construction purposes. It is built to last and it delivers good results when it comes to moisture-removing properties. You can truly rely on this to get rid of excess humidity in the air. Small and Compact: Dri-Eaz F413 Revolution LGR Dehumidifier. If you are looking for a dehumidifier that you can easily squeeze in tight spaces and still ensure that it will work perfectly, get this one. It has a small square size that makes this more ideal to use in places where a regular dehumidifier can’t reach. Easy to Use: Dri-Eaz F203-A 1200 18-Gallon Compact Portable Dehumidifier. If you are looking for a unit that shouldn’t be too complicated to use, this is a good choice. It does not fall behind when it comes to moisture-removing power. It does a good job in collecting excess moisture from the air. With its more portable package, this should be something you can easily use in your commercial space. After all our research, we think the best commercial dehumidifier is the Inofia model. It has outstanding performance and its castors allow for easy movement. The first thing you should do is determine the capacity of dehumidifier you need. Now this will depend on the level of moisture in the space you intend to place it. If the room only gets occasionally damp, one with 40 pints of capacity might suffice. If you can see visible condensation on windows and you frequently have issues with molds, one with 60 pints of capacity and above is a better choice. Noise can be a major concern when it comes to dehumidifiers. Many manufacturers divulge details on the noise level that their dehumidifiers emit. You can use that to compare how noisy the machine is with other machines and determine whether it is going to be a good fit for your home. Compare energy consumption as well. Since commercial dehumidifiers are bigger, they will also inadvertently consume more energy. More energy consumption means higher energy bills. Compare energy efficiency and determine if the one you are buying has energy-saving features. How are you going to install the unit? Is it a kind of plug and play device? In most cases, you will need to connect it to a drain hose and direct it to an available drain, so you no longer have to remove the contents of the water reservoir. This is a more convenient set-up for a commercial space. Set aside a budget for a commercial dehumidifier and look for those that fit your budget range. Make sure you are reasonable about your budget range and you choose products that won’t cause you to go out of your budget but still has the features you are looking for. 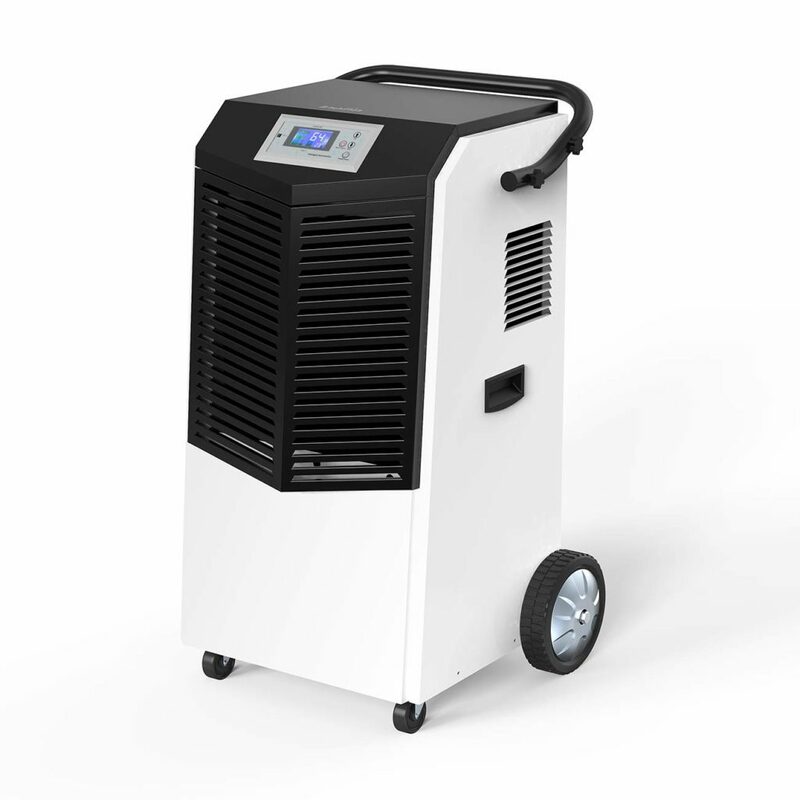 By now, you should already have an idea which commercial dehumidifier to choose. Click the link of the product you think is the best choice for you. Also make sure you read our other reviews and buying guides, so you can find more dehumidifying products to rely on. Humidity Levels In Basements: What’s Ideal & What Should You Do About It? The Differences Between Humidifiers & Dehumidifiers: Which Do You Need?